You could use any shellfish for this recipe, especially if you find the prospect of shucking the oysters too daunting - visit the Fish Service Counter for inspiration. The delicatessen range of marinated and grilled vegetables (from the chiller cabinet) is ideal for this dish and saves lots of work. Dab the cooked crevettes dry with absorbent paper. Wrap some smoked salmon around the bottom of each breadstick half, making 4 pieces. 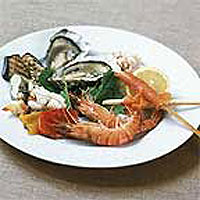 In the middle of each of 2 large plates, sit an oyster on a bed of salad leaves. Arrange the breadsticks, a crevette, some potted shrimps and fresh crabmeat, artichoke hearts, aubergines and peppers on each plate. Serve with a lemon wedge. Alternatively, arrange everything on 1 large platter to share. To shuck the oysters it is best to use a specially designed oyster knife with a short, inflexible blade and sturdy handle. Wrap the oyster in a folded tea towel to protect your hand from any splinters from the shell. Firmly but carefully, push the knife between the upper and lower shells to break the 'hinge' of the oyster and twist to prise the shell open. Then cut the muscle from the top of the shell without piercing the oyster.